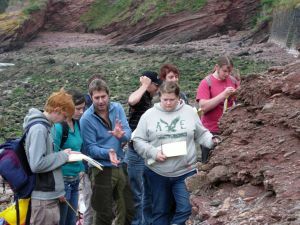 During the time period known as the Permian, 280 million years ago, Torbay lay around 15 - 30 degrees north of the equator and was sweltering in the intense heat of a desert that covered most of Britain and Europe. 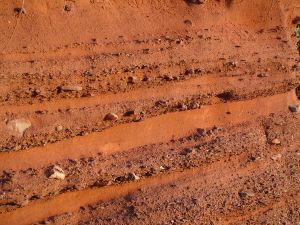 Oxidation of the irons in the rocks, turned them red ý and this intense colour still stains the soils of south and east Devon today. Reconstruction of the Goodrington area of Paignton during the Permian, artwork by Brin Edwards. Paignton lay in a broad depression with jagged, mountainous ridges of limestone and slates on either side. Extreme, violent storms caused flash-floods in the mountains, sweeping stones and rocks down desert valleys known as wadis onto the plain where the water rapidly sank into the parched rocky and sandy ground. 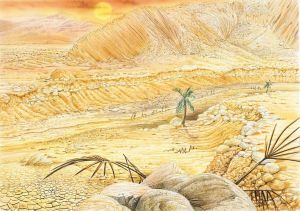 Very little seemed to have been able to survive in these Permian deserts, although near Goodrington strange burrows up to 10 cm across in stony wadi deposits may indicate a survival strategy for a primitive reptile - dig a hole and wait until the cool of the night time to come out! As they were deposited after the Variscan Orogeny the Permian deposits remain undeformed, gently dipping beds lying on top of the irregular, eroded surface of the folded Devonian rocks.